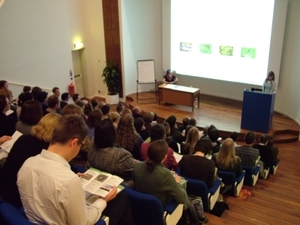 A "Planning and Biodiversity Conference" was held at the at the Moller Centre in Cambridge (www.mollercentre.co.uk) on Thursday 14th April 2011 from 10 am to 4.15 pm. The conference provided an overview of the latest developments and emerging best practice related to spatial planning, development control and biodiversity and featured a series of presentations and case studies. Unless stated otherwise all the documents linked below are PDFs which can be read using the free Acrobat Reader. The day started with an inspiring talk by Tony Juniper, a well-known campaigner, author and environmentalist, who writes for the Guardian. This was followed by a presentation by Gary Grant, an independent ecological consultant with three decades of experience including regional and green infrastructure planning. 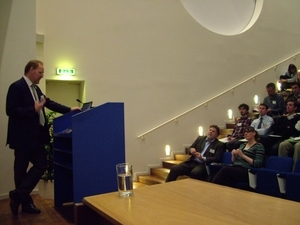 Robert McCracken QC, a leading public, planning and environmental lawyer who appears at all levels from the European Court of Justice to magistrates courts and planning inquiries then explained about environmental planning law within Local Authorities. Useful links: Supreme court rules on Habitats Directive (2.7Mbytes) and an article on Local Government Lawyer. The afternoon session opened with Brian Eversham, Chief Executive of the Wildlife Trust for Bedfordshire, Cambridgeshire and Northamptonshire explaining how voluntary bodies can assist Local Authorities in meeting their biodiversity obligations as the "Big Society in action". Heather Webb, Biodiversity Coordinator for Bedfordshire, then explained how biodiversity information is being used to "Predict Wildlife Site Sensitivity to Visitor Pressure". There then followed breakout groups in which the role of biodiversity data in planning decisions was explored. Workshop Notes (24KBytes), Snapshot of real BRMC data (1.2MBytes). 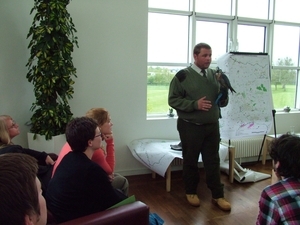 Gary Butcher of Wingbeat Falconry toured the group sessions, allowing close examination of a Peregrine, explained their life-style and how they are protected by the law.